Take a tour around Louisiana and you will find stuffed bread, also known as pistolettes, on many menus, from fancy restaurants to truck stops. There are so many varieties of stuffed bread. The stuffing can range from Cajun specialties like crawfish etouffee, boudin, andouille sausage, and shrimp creole to spaghetti and meatballs, spinach and cheese, and taco fillings, just to name a few. The bread can be French bread, soft rolls, fried rolls, biscuits, or even pizza dough. Stuffed bread can be stuffed with just about anything. I think that is why stuffed bread is on so many menus—it’s an easy outlet for leftovers. I remember the first time I had stuffed bread. It was my first trip to the New Orleans Jazz and Heritage Festival when I was 12 years old. I remember smelling the delightful aroma before reading the sign, “Famous Crawfish Bread”. I then remember slightly giggling and wondering, how could bread be famous? When I had the first bite of the delicate hot bread, filled with juicy crawfish, perfectly seasoned with an oozing cheese filling, I knew the answer. WOW! What a deliciously delightful taste sensation! One I crave every year. You can still get the crawfish bread at the Festival, or The Fest as locals call it. In fact, it is the only time and place you can get it. Simply look for one of the longest lines and be patient. It is well worth the wait. This stuffed bread dish that I created is a combination of all my favorite stuffed breads. It has a creamy crawfish layer, a spicy layer, and a sausage filling. The crawfish buttercream sauce is also a perfect excuse to pull the frozen crawfish tails from the freezer. Preheat oven to 350*. In a bowl, combine sausage, beaten egg, bread crumbs and seasonings. Form mixture into 6 logs. Arrange on a rack over a shallow baking pan. Bake 20 minutes or until cooked through. Cut a small hole on one end of pistolette, reserve end. Use fingers to press around inside making a hollow. Push sausage into bread. Firmly push end back into bread. Mix flour with Cajun seasoning. Dip bread into egg wash then into seasoned flour. Fry 1 1/2-2 mins. Heat saucepan on medium heat. Melt 2 TBSP of butter. When melted, add crawfish and seasonings. Cook for 2 minutes. Add cream and bring mixture to a boil. Stir, reduce heat to low, simmer for 3 minutes. Remove from heat. Stir in remaining butter and green onions. In a small saucepan over medium high heat, reduce vinegar and corn syrup until it coats the back of a spoon. Add peppers and pepper flakes, if desired, Reduce heat and cook until peppers are soft. Add pinch of salt. Let cool. 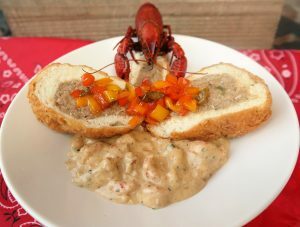 Serve stuffed bread with crawfish buttercream sauce topped with 5 pepper jelly. Put Your TO COOK IS TO CREATE Thinking Cap On: The beauty of stuffed bread is how personalized you can make it. Fill it with your favorites. Stuffed bread is so easy, especially when the filling is already cooked. Think of your leftovers. I like to add ricotta cheese to leftovers for an extra creamy filling for Italian and meat leftovers. Have smoked sausage or leftover meatloaf or hamburgers? Use in place of the bulk sausage and save some steps and time. Want to go meat free? Use vegetables like broccoli or spinach and cheese or a blend of mushrooms. Don’t want to deep fry? No problem. Enjoy them simply warmed in the oven. Want an extra layer of flavor? Brush bread with melted butter and sprinkle seasonings or cheese. No crawfish for the buttercream sauce? Substitute cooked shrimp or crabmeat. Not in the mood for stuffed bread? Enjoy the sauce over blackened chicken or fish. 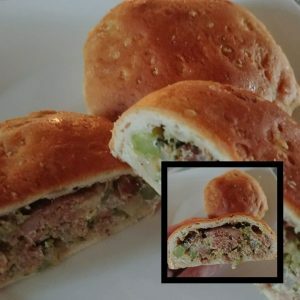 For one of my TUESDAY’S TIPS a long time ago, I shared how easy it is to use store-bought biscuits and leftovers to make stuffed bread. It still is a go-to in our house for a quick and easy hand-held meal, especially with the grandkids. FOOD FUN: This was a recipe I created for the TASTE OF AMERICA challenge for the World Food Championships. Certain ingredients had to be used. It was fun to create a dish that not only met the challenge requirements but also let me blend all my favorite stuffed bread flavors into one dish. This dish is probably something that I wouldn’t have thought about without the culinary challenge. This dish, “Pig in a Cloud” may have not won the challenge, but it won over my taste buds which makes it a winning recipe in my book. Crawfish Bread…….say NO MORE….the taste buds are salivating! It just can’t get more delicious than this creation! Fantastic recipe and the whole family truly enjoys. Freeze those fresh tails and have your stuffed bread whenever your heart desires!! !